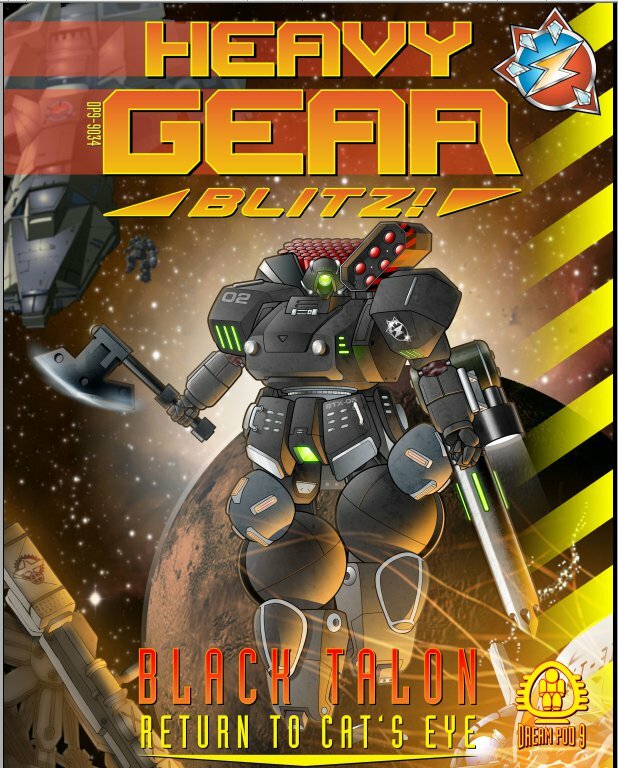 The Heavy Gear Blitz: Locked and Loaded rulebook covers a wide variety of the factions available to play with in the Heavy Gear universe. If you want to start a Northern, Southern, Peace River, The Leagueless, or the Port Arthur Korps army, Locked and Loaded is the best place to start. You really can do a lot with that single rulebook alone, there's so much covered within those pages. The rest of the forces, however, are covered in the supplement books that followed its release. Black Talon Return to Cat's Eye is one of those books. As the name implies it covers the Black Talon, but it also introduces players to two other factions as well. This book is 126 pages in all, which is quite beefy for a supplement or expansion book. Many stand alone core rulebooks aren't this big. Everything is presented in full color, with loads of art and photographs, in painstaking detail. I think of these sections as a codex, like those you'd pickup and buy if you wanted to play a Space Wolves or Dark Eldar army in Warhammer 40k. The sections detailing the armies are that thorough, and all of these sections are on par with what I found in the original Locked and Loaded rulebook covering other factions. The hovertanks and infantry in the CEF lists look really nice. All of the gears are grouped together into what they calls Frame Squads in the CEF, and all of the CEF Gears are equally as impressive as the tanks and infantry. I like that they infantry called GRELs (Genetically Recombined Experimental Legionaries) are somewhat like the disposable heroes, or Clones from the Star Wars pre-quels in the sense that they're not given a name or rank, just an ID, and are considered “property”. Of all the infantry pieces I've seen based on the online store images, the GREL are the most attractive looking of all the infantry models options currently available. They even make GREL on hoverbikes, which I think would be a lot of fun to field. The next section introduces players to the Caprice/Caprician forces. These are some unique looking forces, as they're made up of mostly spider-like-looking machines, only with four legs instead of eight. There's some infantry, and a wide variety of different four legged warmachine configurations to choose from, but they have no Gears at all. Now granted, one nice thing about Heavy Gear is that the game isn't all about the Gears. It's a game of combined forces, so they're just one of the many tools available on the battlefield for would be Generals to choose from. Having said that I'm sure they're formidable, but I'm just not a fan personally of the Caprician forces. Visually they really do nothing for me, and I think they're quite bland to look at. Others mileage will definitely vary, as I've seen some very nicely painted Caprician forces online, so it's clear that others find them worthwhile to play. In the book pages 26-43 covers the Caprician forces in-depth, with enough information provided to know what's needed to build a force, and to also get an idea of what the Caprician forces are all about. The Black Talon is what most people will be buying this book for, and they're quite intriguing. They're a force made up of mostly existing Gear chassis, only retrofitted with new actuators, life support systems, even new power plants, plus stealth capabilities. In a Black Talon force there's essentially Dark versions of the existing chassis like Dark Cheetah, Dark Jaguar, Dark Mamba, Dark Kodiak and so on. Be it a photo, or artwork, the imagery for everyone of the Black Talon pieces is outstanding. It's too bad that they don't make actual Black Talon Infantry models yet, because the picture in the book shows an insanely cool rendition of a bug-like helmet, with some really slick stealthy armor, which would look stunning on the table in model form. Browsing through the DP9 online store when looking under the Black Talon model listing, they offer Peace River infantry, and state that they can be used in a Black Talon force. That's too bad, because while the Peace River models look really impressive as well, they don't look quite as sweet as the actual Black Talon Infantry artwork in the book. In all pages 44-64 covers the Black Talon in detail, with all that players need to create a Black Talon army from, plus a lot of nifty fluff. Pages 65-74 is a section called simply New Rules. This section includes a boat load of not only new rules, but it reads a lot like an FAQ as well, which helps to integrate the new factions outlined in this book with all of the previous existing factions, along side with some little improvements to boot. Things like different battlegrounds are covered, including ship interiors, the Caprician Surface, and how to utilize different Gravity and Atmospheric settings previously not outlined in the Blitz: Locked and Loaded rulebook. 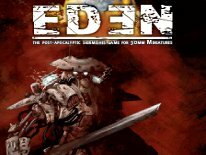 There's even a little info on expanded Jump Jets, plus rules and guidelines for uneven Threat Value games, and story driven engagements. Pages 75-77 offers three pages worth of Painting Guide material, showing off some nice Caprician, CEF and Black Talon paint schemes, with other painting hints and tips as well. Pages 78-83 detail astrological maps, and offers some info about the Helios system and the Interstellar Web Map. Next pages 84-98 digs into the timeline where Locked and Loaded left off, offering lots of fluff on the happenings in the Heavy Gear universe concerning the CEF, Black Talon and Caprice factions in the process. Pages 99-109 begins with a day by day account of the Battle of Terra Nova, later switching to a front by front retelling of the battle as it ensued. And lastly pages 110-126 features all of the data cards for all of the models found within the book for the Caprician, CEF and Black Talon forces. The version I reviewed here today is the full color .pdf format version of Black Talon Return to Cat's Eye. It will set you back $22.50 USD from Drve Thru RPG/RPG Now/WargameVault. The printed version in black and white is $25 USD direct from DP9, and the full color printed version will set you back a whopping $45 USD. As much as I like this book it in full color, honestly, I'm one who prefers a printed dead tree copy, as it's more useful to play actual games with, since I don't have any electronic devices that would allow me to utilize a .pdf at the gaming table. I also think most gamers could live with paying the extra $2.50 for the B&W printed version, over spending $22.50 on the full color.pdf. It's more cost effective too, since printing in full color is roughly 50-cents a page. To pay to print the pdf in color is redundant. You're simply better off buying it already printed in color all nice and ready to go from DP9, because it's definitely a lot less than the cost of buying the .pdf, and then paying to have it printed and bound. 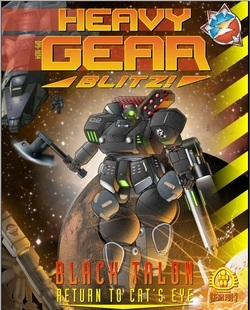 The black and white version of Heavy Gear Blitz: Locked and Loaded that comes with the starter set looked really nice, and nothing was lost in the conversion to B&W, aside from the painting guide stuff. I'd imagine you could expect the same printing quality from Black Talon Return to Cat's Eye as well in B&W. Therefore the B&W printed version is probably the best value overall, that is if you didn't have laptop to carry around or an eReader device to make full use of the .pdf version in color. This book is simply a must of you want to build a CEF, Black Talon or Caprician force, because this is essentially the primary source book for those factions. Some of the later books include some updated units and what not, but this is the book you want to start with to build any of the three forces mentioned within it. Like the other Heavy Gear books I've seen thus far, this one is also a high production value effort, rivaling and quite possibly besting the works of Privateer Press's Warmachine and Games Workshop's 40 Codex books even. If you're bored with the factions found within the core Blitz: Locked and Loaded rulebook for Heavy Gear, or if you just want to try something new, the Black Talon Return to Cat's Eye book is the next logical step to take.